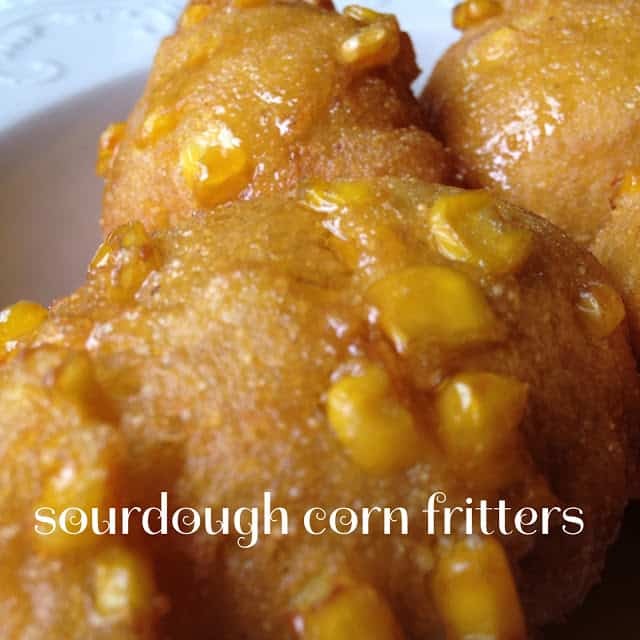 Made with fresh corn, sourdough corn fritters are the perfect accompaniment to any meal. 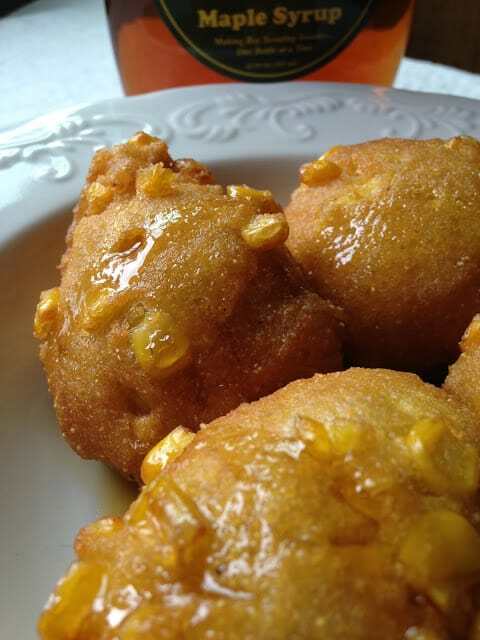 We enjoyed these delicious corn fritters with a light drizzle of maple syrup but sourdough corn fritters will be delicious served in place of cornmeal muffins alongside soup, stew or chili. 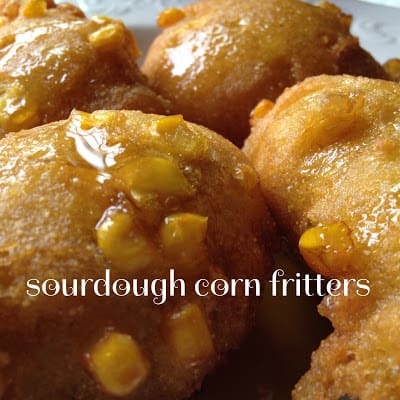 A fritter is a small, sweet or savory, deep-fried cake made either by combining chopped food with a thick batter or by dipping pieces of food into a similar batter. 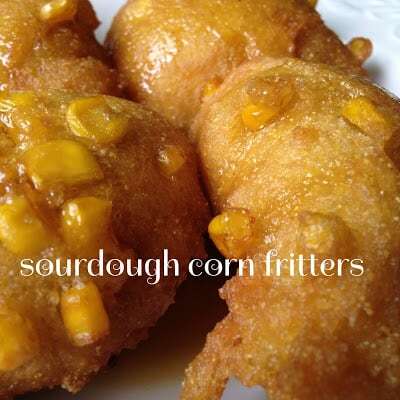 Some of the most popular foods used for fritters are apples, corn and crab. Prior to the evolution of commercially available baking powders and yeasts during the 19th century, yeast starters were the leaveners used in bread-making. Such starters are a simple mixture of flour, water, sugar and yeast. At one time, airborne yeast was the only source used but today convenient commercially packaged baker’s yeast is more common. I used the airborne yeast method when I started my sourdough starter and while maintaining my sourdough starter. This batter is set aside in a warm place until the yeast ferments and the mixture is bubbly or active. A portion of the starter, usually about 1 cup or 2 cups, is removed and used to leavened breads. Once fermented, yeast starters, the most famous which is sourdough starter, can be kept going in the right environment for years simply by adding equal parts flour and water. A starter should be refrigerated and can be stored indefinitely as long as it’s replenished every 2 weeks. Before using, starters should be brought to room temperature. Two cups of the bubbly, active starter mixture can be substituted for each package of yeast called for in a recipe. Mix starter, egg and oil in a bowl. 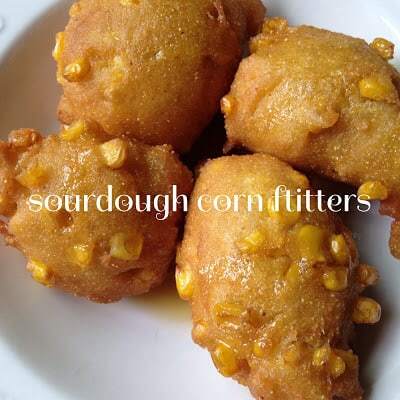 Add sugar, salt, baking soda, cornmeal and corn kernels. Let the mixture stand at room temperature for about 1 hour. Heat oil to 375º in a large, deep cast iron skillet or Dutch oven. Drop batter by tablespoons into hot oil. Fry until golden brown. Remove from oil, drain on paper towels. Serve immediately with maple syrup and/or butter. Looking for more sourdough recipes? Try these..Sourdough Cinnamon Raisin Bread and Cheese and Bacon Sourdough Biscuits. For super fresh corn-on-the-cob, head to your local farm stand, farmer’s market or if your in the Black Creek WI area make sure to stop at: Wagner’s Market.